In a surprise twist, IMSA has elected to leave the balance of performance for almost all GTLM class cars untouched for the 2019 Rolex 24 at Daytona. The motorsports sanctioning body usually makes a series of BoP adjustments following the annual Roar Before the 24 pre-season test to closer align the speeds of the various cars in the field. It has decided to leave many cars alone following the Roar this year, however, including the Corvette C7.R of Corvette Racing. The only GTLM car that received an adjustment this year was the BMW M8, which will now have an increased fuel capacity of two liters to 90L. The lack of BoP adjustments could be a good omen for the Chevy squad, which took pole in the qualifying session following the Roar Before the 24. The mock qualifying session decided the pit stall selection for the race, with the grid-deciding qualifying session scheduled for Thursday, January 24th ahead of the race start that Saturday. Corvette Racing is sticking to its familiar formula for 2019, running the Corvette C7.R for one last season and remaining with drivers Antonio Garcia, Jan Magnussen, Tommy Milner and Oliver Gavin. It is widely believed the team will switch to the mid-engine Corvette C8.R for the 2020 IMSA season. The Prototype class will also go largely unchanged with regards to BoP. The Mazda DPi entries, which were extremely fast at the Roar, only received a reduction in fuel capacity of two liters to 79L. The Cadillac DPi-V.R, four of which will race in IMSA full-time this year, received a reduction in fuel capacity of one liter. Similarly, the Acura ARX-05 received a reduction in fuel capacity of two liters. The Nissan DPi will go unchanged. The 2019 Rolex 24 at Daytona is set to kick off on Saturday, January 26th. For international viewers, coverage can be found at IMSA.tv. NBCSN will also air coverage of the race for US fans, but viewers will have to switch to the NBC web player for certain portions. A full broadcast schedule can be found at this link via IMSA.com. 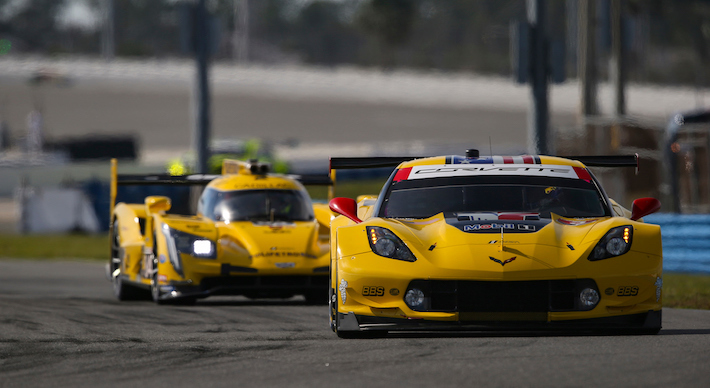 Be sure to check out our Corvette Racing news page for more coverage of GM’s factory race team. Well, the Ford family told IMSA that unless they get another Daytona, they’re not gonna play in the IMSA sandbox with DPi’s next year. Meanwhile Fehan and Corvette soldier on with yet more integrity and honesty. NASCAR also gave ford a aero break this past year because they had not won a championship in 15 years and they were afraid they may pull out of NASCAR if Toyota won again. And let us not forget the consistent sandbagging by Ford in qualifying for Daytona and LeMans…all for favorable BoP. I hate to say it, but sometimes I wish Corvette had more “gamesmanship” in qualifying. Maybe then they would have had a chance in both races.